We’re kickin’ it old-school today, friends. If there was one dish that would represent the Midwest (or are we called the North now?) hotdish would definitely win the title. I think I do a respectable job of exposing my family to worldly cuisines, but to be honest I’m a product of North Dakota and Minnesota, so there’s something that I find so comforting in a good hearty, potato hotdish. It’s a bit of nostalgia from my childhood, but it also just tastes so good. 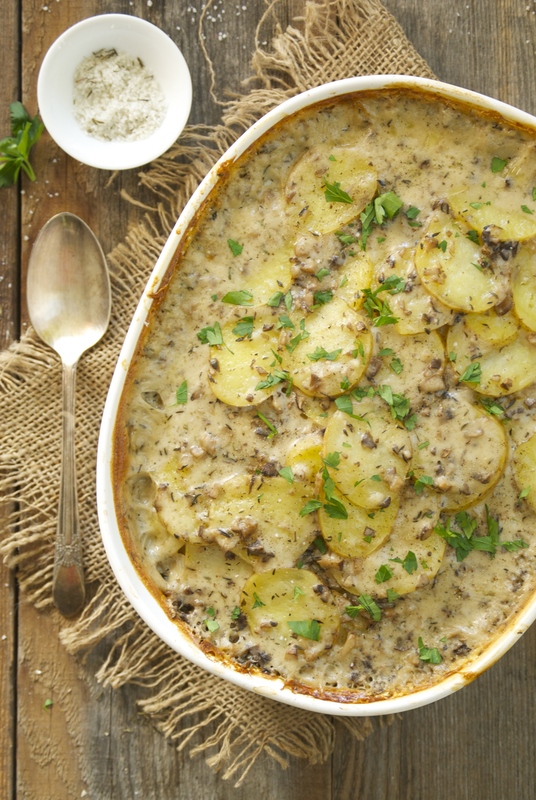 Hotdish can be made from a variety of ingredients– pasta, rice, or potatoes are generally combined with vegetables and proteins and a sauce of some sort. My favorite is this one made with potatoes. It holds together so well and the leftovers are fantastic. Pasta hotdish leftovers, as you can imagine, become a bit mushy. But potato versions? They just keep getting better. 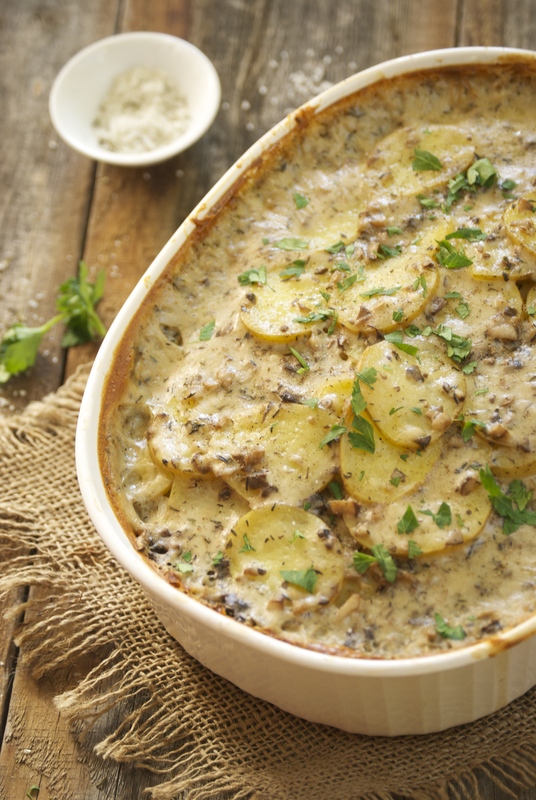 The hamburger potato hotdish of my childhood isn’t exactly the version I’m sharing with you today. My mom would make a version, probably like most of the other moms in the Midwest, using a couple cans of condensed soup. You know the brand. It was fine. It was lovely. I’m thankful that she made us delicious food. Do I make my own hotdish using that can of condensed soup? You already know I don’t because I like to keep processed food to a minimum in my house. Maybe I’m a bit of a control freak and I hate that I can’t control what’s going into that soup. Maybe I hate that it has been setting on a shelf for weeks, months, or longer. Maybe I hate preservatives. Or maybe it’s just so easy to mix up my own– it takes just a few minutes and it tastes about 1,000x better? 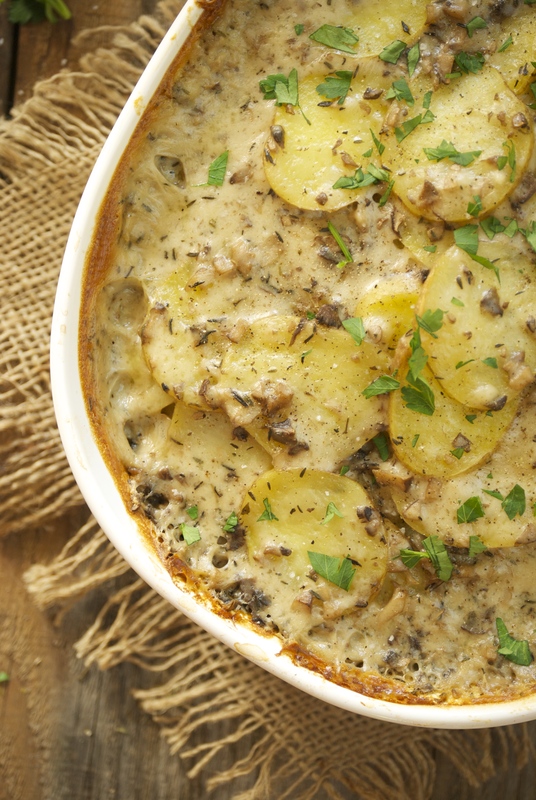 My point is, with whole ingredients, this hotdish is sensational. This is mid-winter Midwest food at it’s best. We love the peas and carrot version that I’ve photographed here. But another classic combination that we enjoy is fresh green beans and corn. So good! Also, give brussel sprouts a try, as well– amazing. You can really modify this recipe to suit your family’s taste. Try using sweet potatoes instead of white. 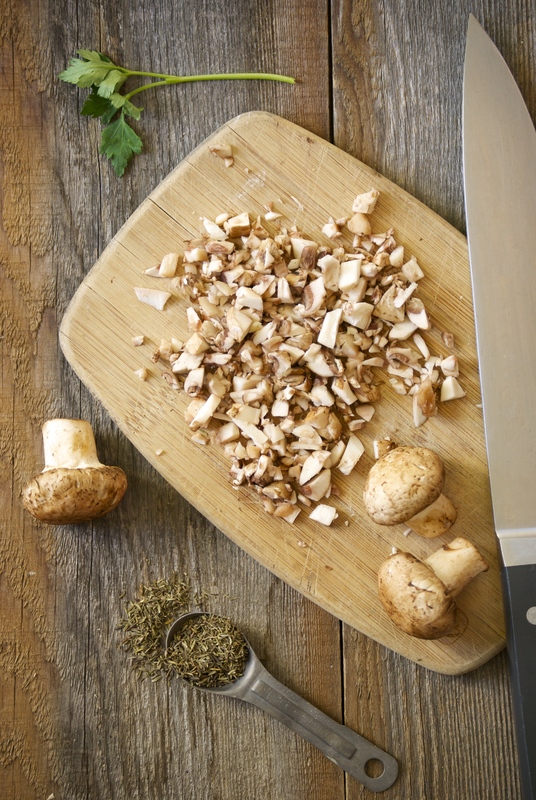 The same goes for the mushroom sauce– use any type of flour that your prefer to thicken it. Make it gluten-free, if that’s what you need. As I’ve mentioned before, the leftovers are incredible. 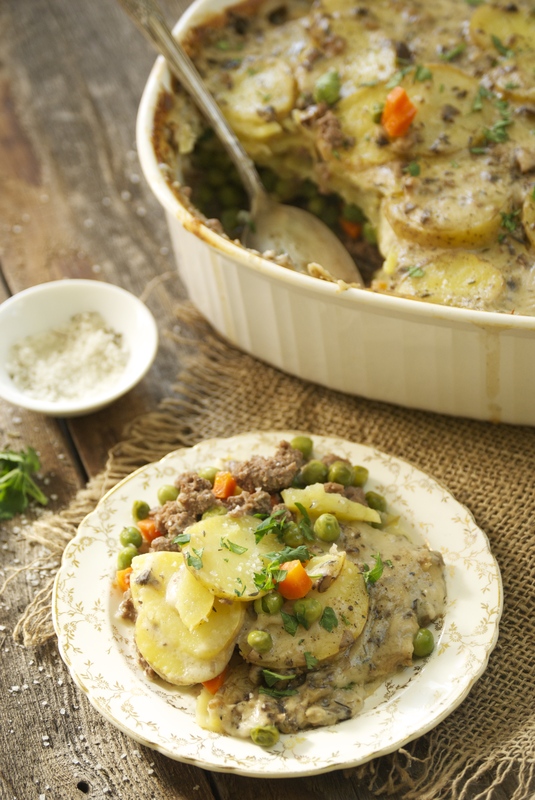 If this is your first time embarking on a hotdish, I hope you enjoy this delicious and legendary dish. Bon Appétit! In a large skillet over medium-high heat, brown the ground beef. Drain the fat when finished. Add the onion, garlic, 1 1/2 teaspoons kosher salt, and pepper and sauté for a couple of minutes until the vegetables become somewhat aromatic. Remove from heat. In a small saucepan over medium heat melt the butter. When melted, whisk in the flour. 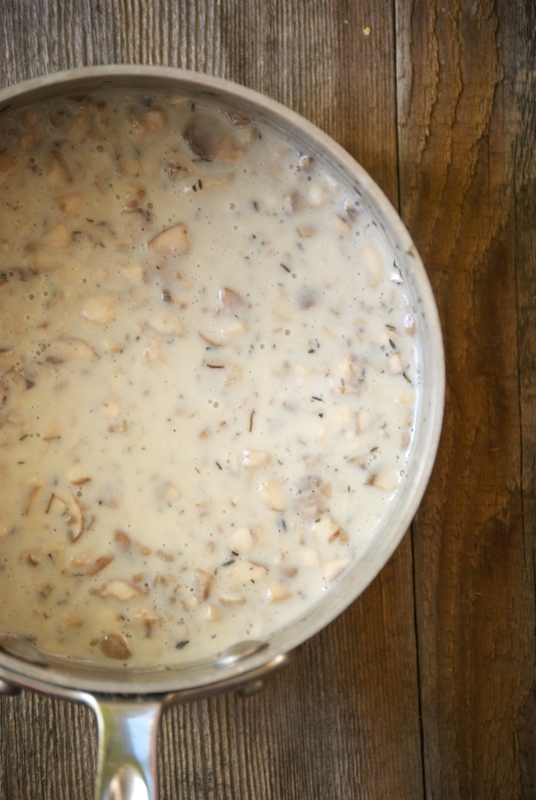 When it bubbles, slowly whisk in the milk, followed by the thyme, rosemary, and mushrooms. Season to taste with salt and pepper. Continue stirring while the entire mixture becomes hot and starts to form bubbles. It will be done when the sauce has thickened a bit, about 5-10 minutes. 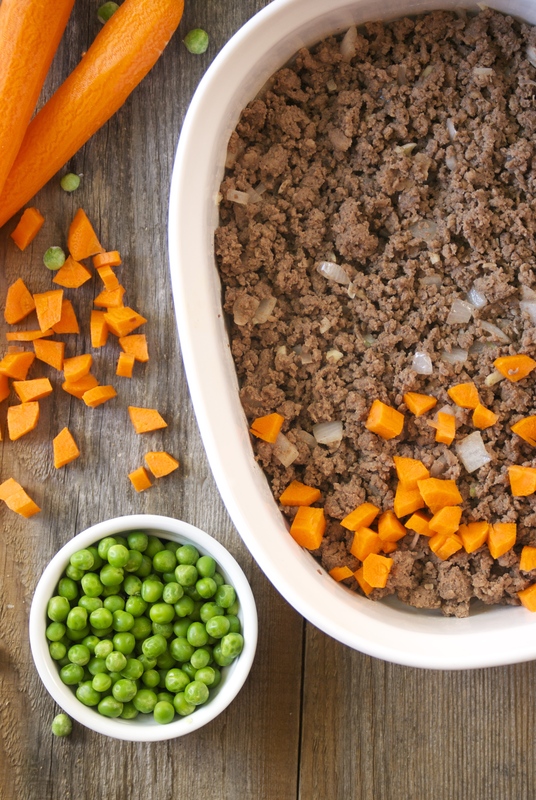 Place the meat mixture in a casserole dish, roughly 11 x 8 x 2. Then toss the carrots and peas evenly over the meat. 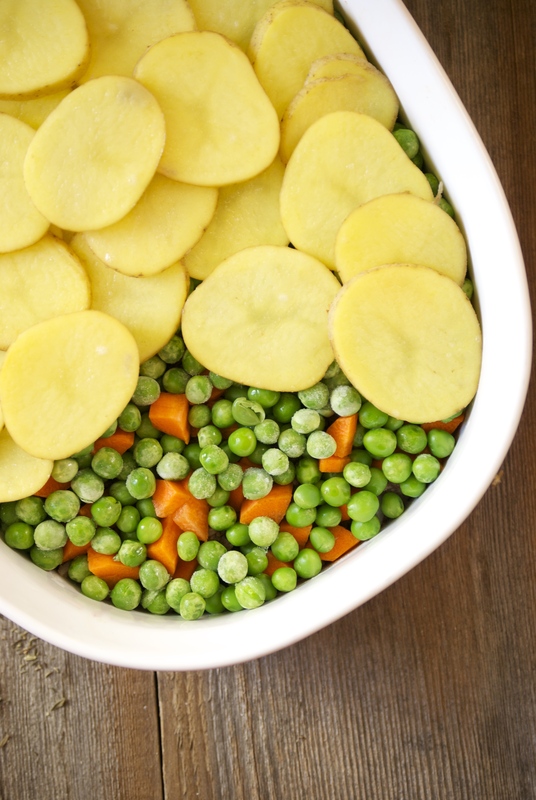 Layer the sliced potatoes next until they reach top of the dish. 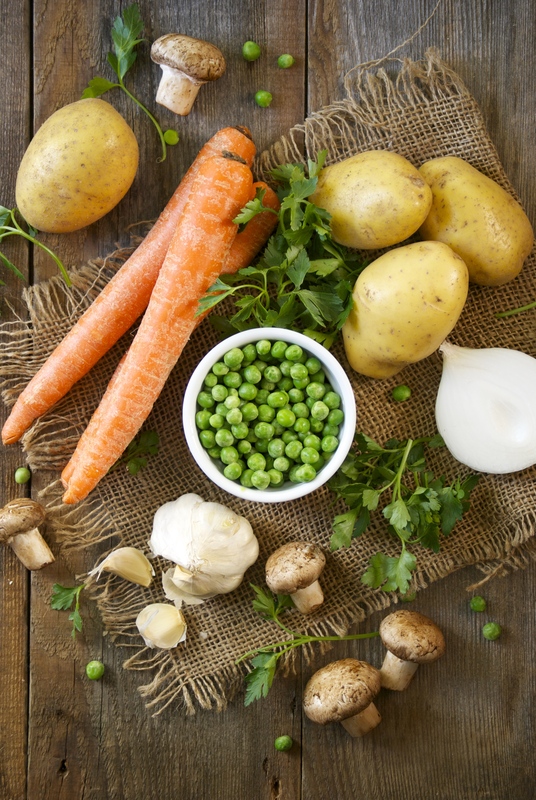 You may need more or less potatoes depending upon the size of your dish. Place the casserole on a large baking sheet to catch any drips while it bakes. Slowly and evenly pour the mushroom sauce over the potatoes. You may want to gently tap the dish to coax the sauce down in between the potatoes. It will settle in more as it bakes, so don’t worry. Cover with a lid or use a tented piece of foil. Bake for about 1 hour, but remove the lid when there are just 10 minutes left to bake. Test the doneness of the potatoes using a fork. Bake longer if need be. Remove from oven and let rest for about 15 minutes before serving, or the juices will run everywhere. Sprinkle with fresh parsley. Enjoy!